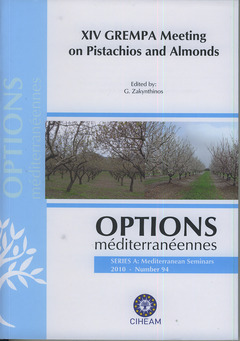 Auteurs : ZAKYNTHINOS G., TJAMOS E., ROVIRA M., VARZAKAS T., TMOMIDIS T.
Ajouter au panier le livre de ZAKYNTHINOS G., TJAMOS E., ROVIRA M., VARZAKAS T., TMOMIDIS T.
GREMPA (Group of Mediterranean Research on Almond and Pistachios) is a research group created during the seventies with the support of the Mediterranean Agronomic Institute of Zaragoza. During this time, GREMPA's work has been mainly based on the study and improvement of almond and pistachio genetic resources with Mediterranean origin, although efforts have been made in all aspects of the production and marketing of these species. The meetings of the group are held periodically every 3 or 4 years to exchange research results and to promote joint research and cooperation among scientists of the Mediterranean area working on almond and pistachio. Orchard management, Physiology-Biology-Biotechnology (including pollination and fruit set), Pest-Diseases, and Industry-Harvesting-Marketing-Quality and Control-Safety.